India and South Africa are celebrating twenty years of strategic partnership this year. The Union Minister for Science & Technology and Earth Sciences, Environment, Forests & Climate Change, Dr. Harsh Vardhan attended the celebrations of the collaboration in science and technology in Durban. The event was co-hosted by the Departments of Science and Technology of S. Africa and India. The South African Minister for S&T Ms. Naledi Pandor along with Dr. Vardhan released a booklet highlighting the two decades of fruitful cooperation in science and technology spanning across the knowledge chain which has resulted into a robust networking of the best researchers and academic institutions. Inter-governmental agreement on cooperation in the field of Science & Technology was concluded in 1995. Since then the S&T cooperation has progressively evolved as an important pillar in the India-South Africa strategic partnership based on mutual trust, warmth and friendship.So far, the cooperation has been focussed on chosen areas like Astronomy & Astrophysics, Agriculture Sciences, Green Chemistry, Indigenous Knowledge System and Health Sciences where both countries have complementary strengths. Since the visit of Prime Minister Narendra Modi to S. Africa last year, the S&T cooperation has seen a significant boost with launch of 8 new projects on Astronomy which will help to augment the Square Kilometre Array (SKA) radio telescope project led by South Africa. Earlier, Dr. Harshvardhan visited the SKA site in Karoo desert and was apprised of the progress of the mega-telescope project in which India is a member country. Indian scientists will be contributing in several design work packages of SKA, notably the Telescope Manager and the Central Signal Processing. Telescope Manager System will be the controlling nerve centre behind the functioning of the SKA observatory. The SKA project will address some of the most interesting science goals in astrophysics, ranging from the very early Universe to the search for intelligent life out there.A multi-institutional project on HIV Vaccine Research Collaboration has been also initiated this year. This is aimed to develop preventive HIV vaccine and will also lead to the identification of biomarkers and development of novel techniques for diagnosis and management of tuberculosis. Dr. Harshvardhan remarked that this is a unique project, where two countries will use science for adressing the health care needs of people of both countries, in the area of HIV and TB.Another hallmark of the vibrant collaboration was the launch of a new program on ‘Grass Root Innovation’ aimed towards sharing of open source technologies and IPR protection of traditional knowledge systems. This program is designed for co-development of products through value addition, validation through product deployment and market ready technology transfer with a focus on affordability. The Minister, added that both India and S. Africa have a rich pool of traditional knowledge which can be leveraged by providing the scientific knowledge base required for technology development for societal benefit. This cooperation on grass root innovation will provide scientific and technological solutions for addressing the unmet needs of the common man. The novel initiative has been aptly named as ‘Gandhi-Mandela Program on Grass Root Innovation’. National Innovation Foundation, Ahmedabad will implement this program on the Indian side. Earlier in a bilateral meeting with the S. African S&T Minister, Dr. Harshvardhan suggested the future expansion of collaboration in the area of renewable energy including solar, wind and biomass which is a potential resource for both the countries. India is a leading country in the International Solar Alliance partnership and has extended an invite to S. Africa to join this alliance. It was also agreed that another area of potential collaboration is on blue economy looking at the marine eco-system including the living and non-living resources of the ocean. Both India and S. Africa are maritime nations and are a part of the Indian Ocean Rim Association. Indian expedition to Antarctica is also launched from Cape Town. The two countries stand to gain by understanding the ocean processes which shapes the climate and coastal eco-system.While in Cape Town, the Minister also visited the famous Groote Schuur Hospital where the first open heart surgery was conducted by Dr. Christian Bernad in 1967. An interaction with scientists at the South African National Botanical Institute (SANBI) was also held and the ongoing cooperation with the Wildlife Institute of India (WII), Dehradun on bio-informatics was highlighted. 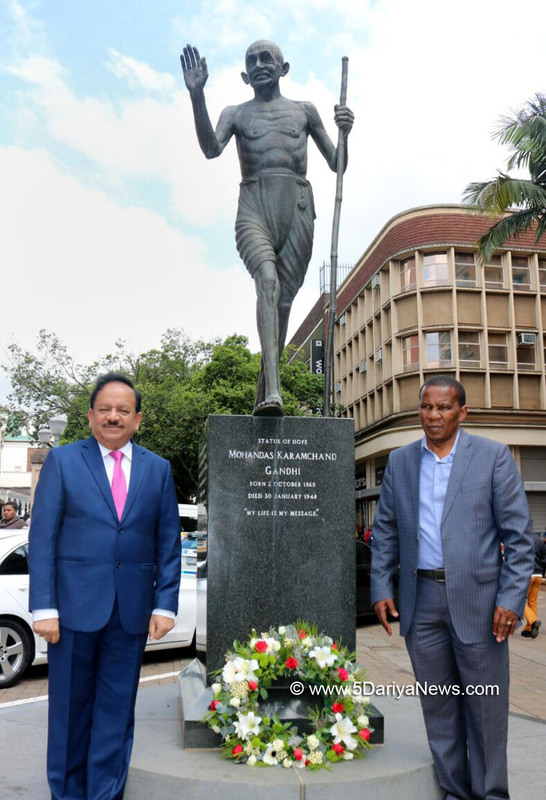 Dr. Harshvardhan visited the national park and the herbarium showcasing the rich flora of the Cape region.In Durban, besides the bilateral meeting with the South African side, Dr. Harshvardhan also paid his floral homage to the Father of the Nation, Mahatma Gandhi, at the Pietermaritzburg Railway platform, where the Mayor of the city welcomed him and conducted a tour of the Gandhi exhibition at the station. At the India House in Durban Dr. Harshvardhan interacted with the Indian community and highlighted the major programs of the Government and urged them to contribute and remain connected in the various development facets of India.